Here are some easy ways to support FCA financially just by doing your regular shopping. If you shop at Amazon.com, Amazon will donate 0.5% of the purchase price of eligible products to our school. Just click on the link http://smile.amazon.com. Using this link to begin your shopping does not change your Amazon account. It just allows Amazon to donate a portion of your purchase price to our school. Just clip the BoxTop from all participating products and bring to FCA. 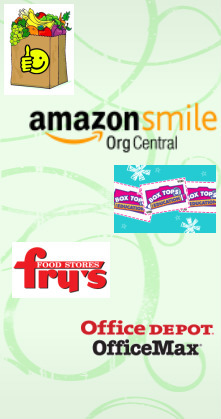 We receive 10 cents for every BoxTop we submit. Register your Frys Rewards Card online at frysfood.com and FCA will receive a percent of purchases. We benefit and you only have to grocery shop! We can earn store credit at Office Max for turning in empty printer cartridges. Please bring your empty cartridges to the FCA office and help us keep costs down. Also, if you shop at OfficeMax, give them our school name or school ID number (ID # 70237039) and we will receive a percentage of your purchase.